So far we were using instant fire methodology. 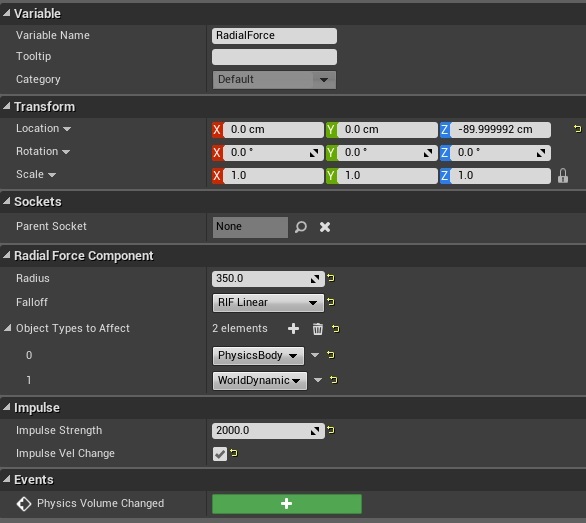 Now it comes time to improve BaseWeapon to be able to shoot with projectile. This will be more advanced post but working with projectiles is fun! We are using Military Weapons Silver grenade launcher. It’s great pack. Recommended for everyone doing shooter game! This will tell us if we are firing using instant fire (trace) or spawning projectile. You can read more about collision responses here. 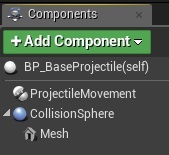 Now if we have our collision preset let’s modify CollisionSphere properties. 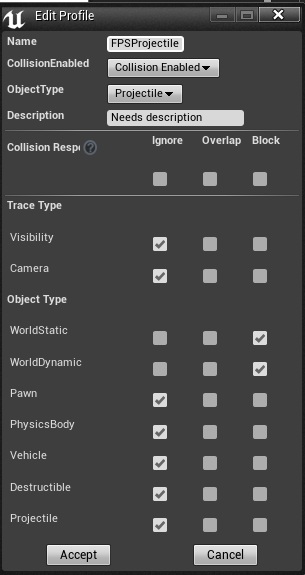 In Mesh make sure your Collision Presets is set to NoCollision! 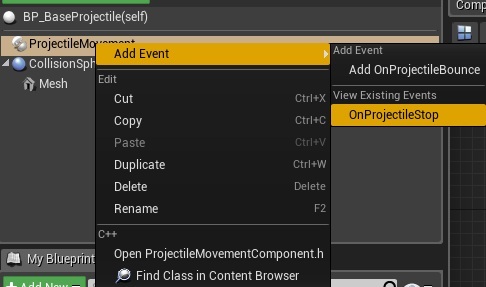 Now if you left click on ProjectileMovement you will be able to add new event OnProjectileStop. Leave it blank for now. We can’t overwrite Events if we will be extending from this class (we will be) so we need to create function named: OnProjectileStop. Note: You don’t have Explode function yet – It will be described here in a sec. 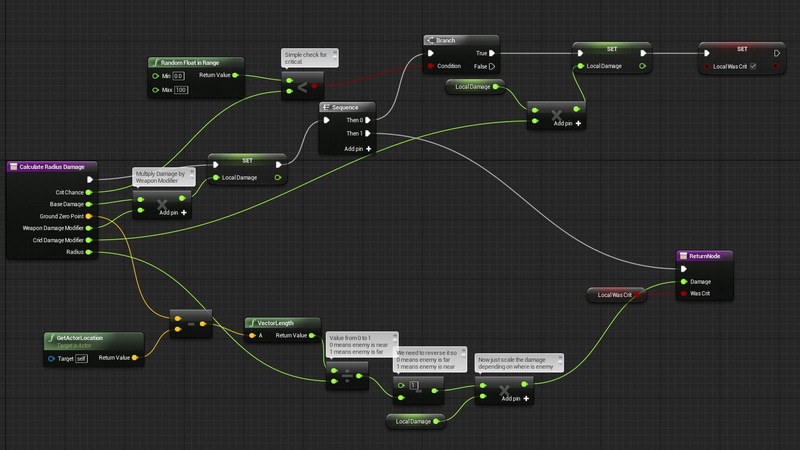 Basically what its doing it’s spawning explosion or doing normal TakeDamage based on projectile properties. This is base projectile so EVERY projectile will use these functions. Now let’s connect OnProjectileStop Function to OnProjectileStop Event we had created earlier. As I wrote earlier – we are using Function for this to be able to “Call Parent” on class which will extend this class. Middle part is only for displaying sphere that have the same radius as in AmmoType. If you want to see it just connect Then 1 to it. You don’t have BP_ExplosionImpulse actor yet. We will create it now. 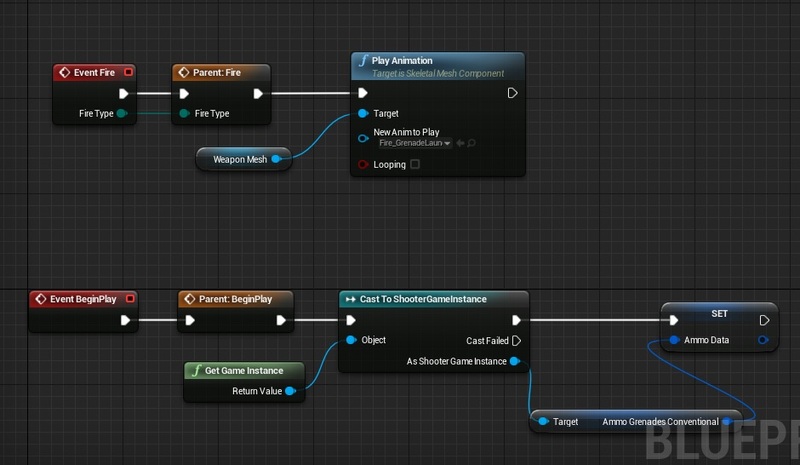 Create new blueprint extending from Actor named BP_ExplosionImpulse. Basically this actor will create impulse that will be added to all PhysicBody and WorldDynamic. There is an issue with Radial Force Component in 4.8 so in BeginPlay you need to call: Fire Impulse on Radial Force component. We need to update our base class for Impact Effects. Open Impact Effect we had created earlier. And update begin play so we won’t check body parts if IsUsingHitResult is false. 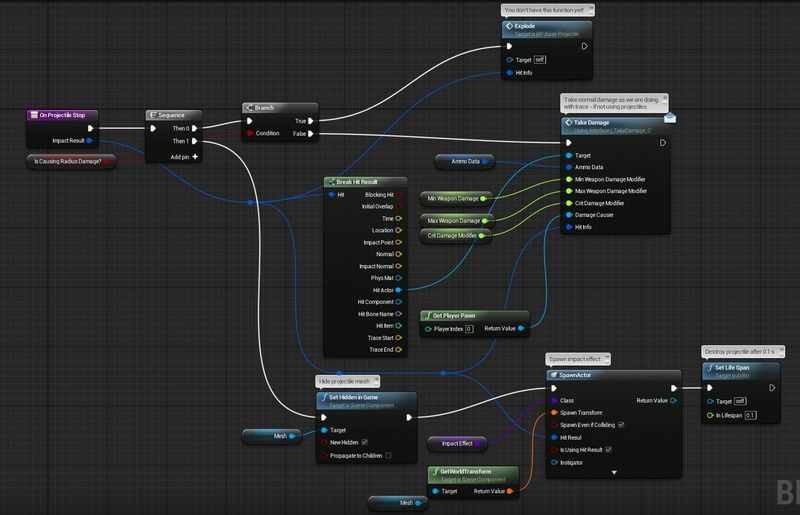 Create new blueprint extending from ImpactEffect. Name it Impact_GrenadeLauncher. 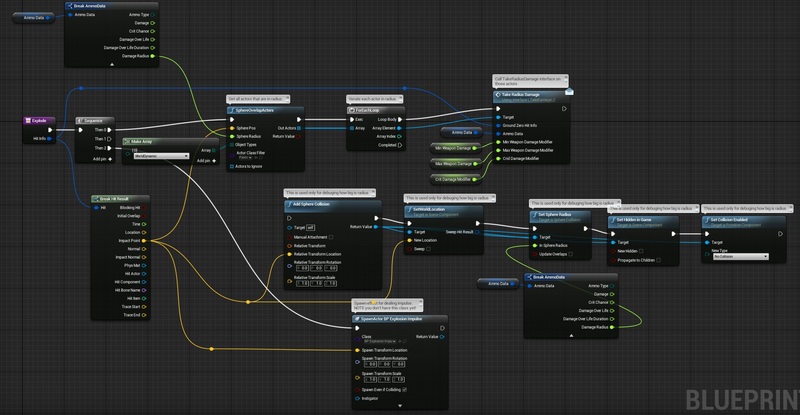 Now Create new blueprint extending from BP_BaseProjectile and name it BP_BP_Projectile_Grenade. Add new component Particle System named: FX_Trail. Choose P_Grenade_Trail_01 as Template. Thanks to BaseProjectile you don’t need to do anything more here. Open mesh HeroFPP_Skeleton and add new socket S_GrenadeLauncher attached to b_RightWeapon bone. Create new blueprint based on BaseWeapon. Name it: BP_BP_Weapon_GrenadeLauncher. Update properties. WeaponType: Shotgun (yes shotgun animation inanim blueprint works fine with grenade launcher. We should rename this variable toAnimationType but I don’t want to do this now. Now let’s assing ammo type and use fire animation on weapon. This is all in Grenade Launcher. Open ShooterGameInstance and add new weapon to Backpack_Weapons. Be sure to change WeaponToSpawn to BP_Weapon_GrenadeLauncher! Now you can equip the weapon and check it out! It won’t deal any damage now, but you will see projectile movement and explosion FX. Here’s the function. Take a look how I’m calculating radius damage. It’s really simple! Now in event graph add Take Radius Damage. In gameplay character make sure you are driving Fire Type to Fire function! USEFUL TIP: If your projectile mesh is to small you can always change size in Static Mesh Editor. okay so im following all the same steps as you and using 4.8 however when firing the projectile the explosion effect happens at my characters feet rather than where the projectile hits? 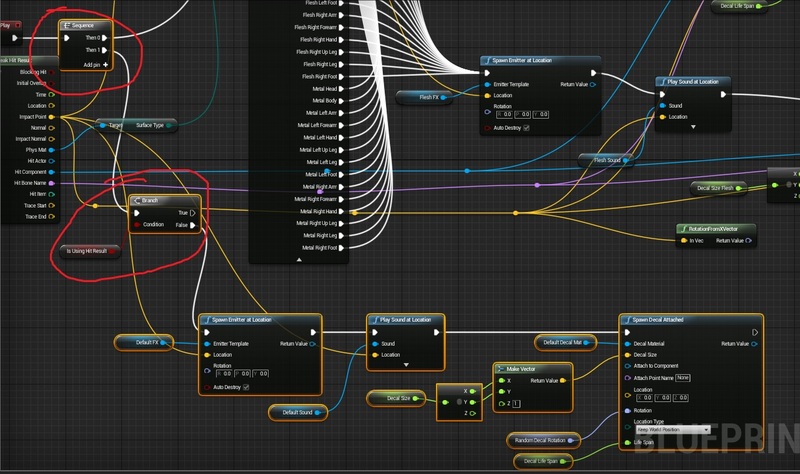 any help or explanation to how your getting the impact effect to happen as the instant hit are just spawning where the trace hits however I don’t see where the hit information is coming from for the projectile? In BP_BaseWeapon instead of using the Get Owner function use Get Player Character function. For anyone also having problems with the grenade launcher for not doing any damage, try changing the Make Array from WorldDynamic to Pawn in BP_BaseProjectile in the Explode function. Thank you very much for the tutorials it helps a lot!! Keep it up! !